Crafty Lady Sandi: Messy Project Kids will love to do! We all know kids love to get messy and if you are a parent with ODC then run from the room!! You will not want to stick around. Just kidding, your help will be required. Pencil outlines a picture to fill in with the paint. More dots spaced closer together to get a darker shade, and fewer dots spaced a bit will make it lighter to create shadows and highlights. Put several color out on the paper plate and to the side some Q-tips. The child takes and dips the Q-tip in the color desired and with the Q-tips dots the desired area. Continue until child is done. Bend a pipe cleaner into a shape desired; above they did a heart shape. Squeeze out the color(s) on paper plate. Pressed the shape into the paint; then, stamped it onto a blank card. 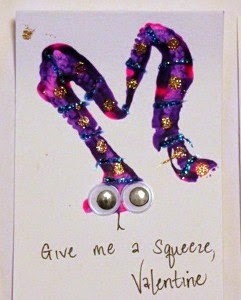 Option: Embellish with googly eye and sequins as shown above. 1/4 self-rising flour – the self-rising part is important! In a bowl mix 1/4 cup self-rising flour, 1/4 cup salt, 4 tbsp. water and a bit of Wilton gel icing color (just 1 color at a time!). Mix the above all together until smooth and runny. Pour your mixture into a Wilton squeeze bottle. Repeat the above process for each color you make – we made a beautiful rainbow of colors. 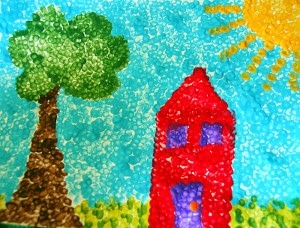 Give the paints to your kiddos and let them go wild. When they are finished their masterpieces, pop them in the microwave for about 20-30 seconds, or until the artwork starts to rise off the paper. 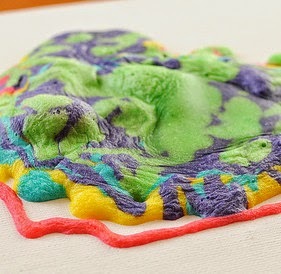 Admire your artwork and check out how cool the 3-dimensional-ness is! Option: After making the colors have the child fill an old mold (microwave safe) with different colors.